but the butterflies did not appear. I worry about that. 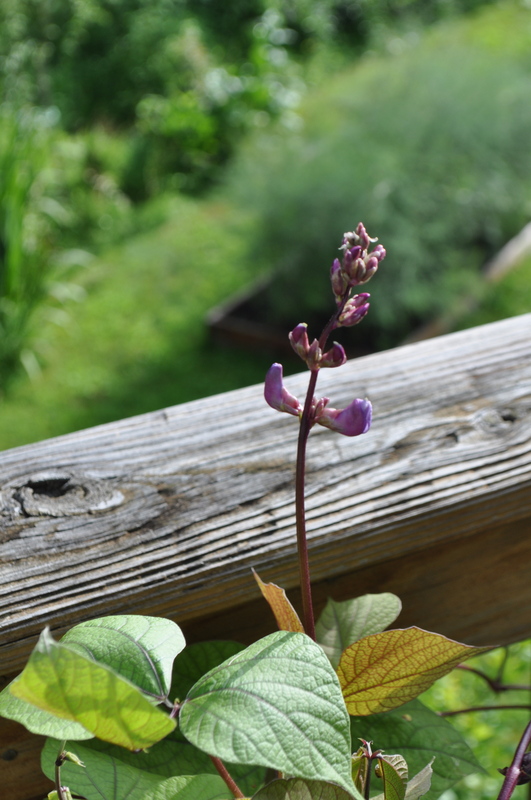 On the deck, the bloom is promising. 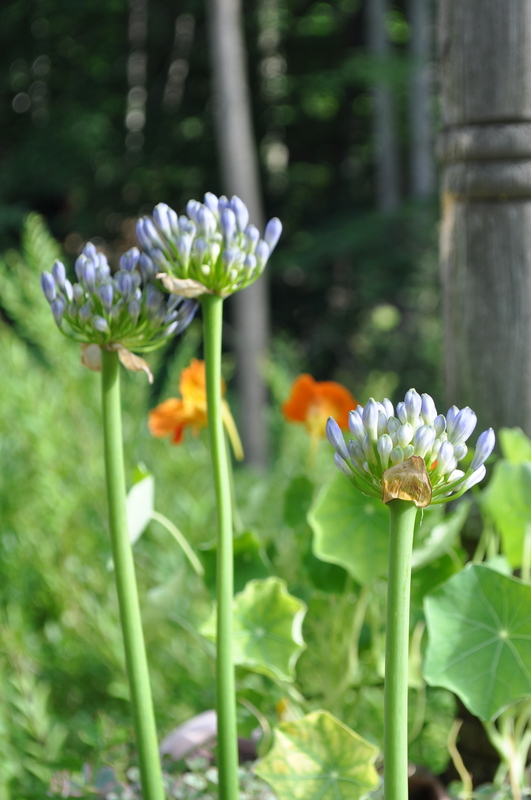 Some agapanthus have more energy than I in this hot and humid weather. They are beginning to start the fireworks! They look well with the cannas. This gladiola lives in a pot year round. The Dutchman’s Pipe (behind)adds a cool green note – so badly needed and such a visual relief on a HOT HOT day. 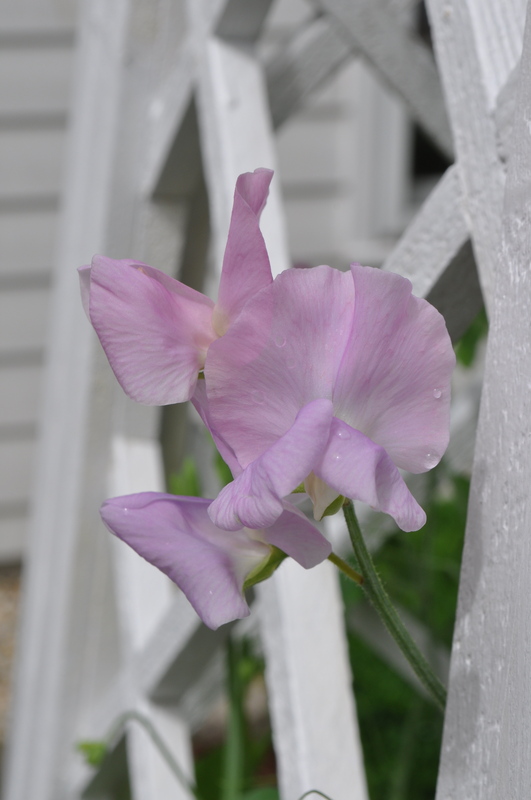 Speaking of hot, one dear climber never appreciates the heat, poor sweet peas. But there are other climbers in my garden that thrive. You may notice fences of all kinds in the backgrounds of my photos. 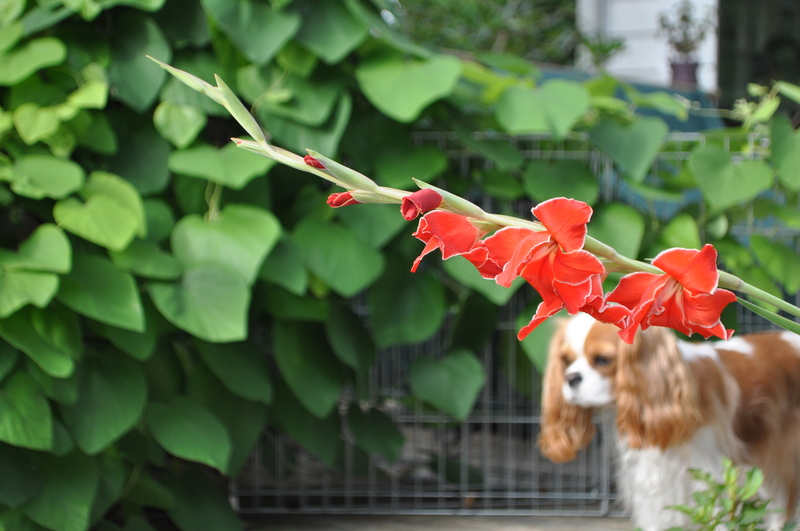 I am not fence crazy, but they are a necessity because of our adored pets, two dear Cavalier King Charles spaniels. These two would be off chasing chipmunks and squirrels if not for the fencing! 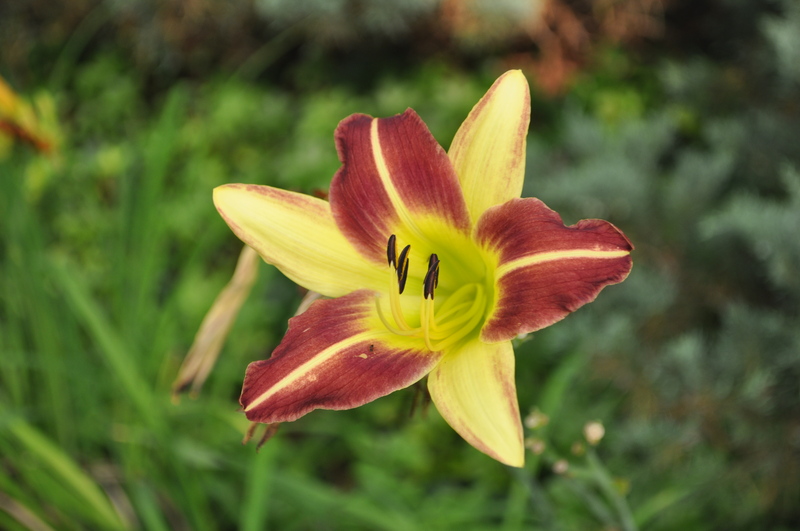 Join the others at Garden Bloomers Blog Day! 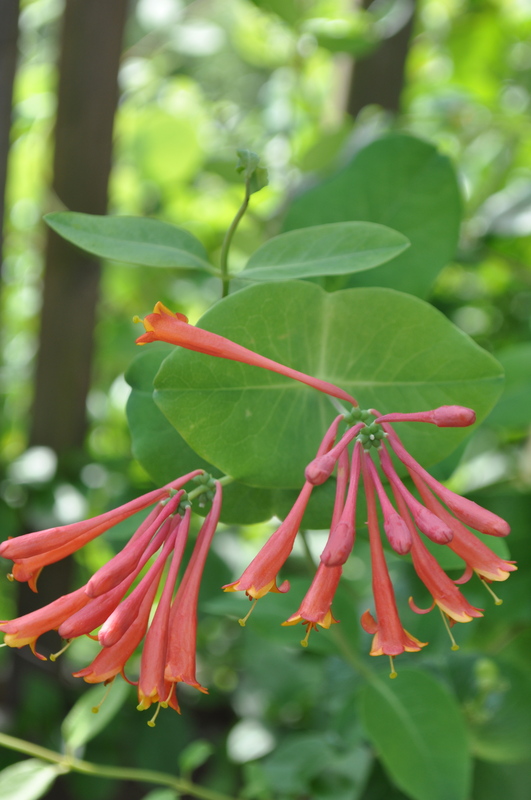 Sponsored by Carol at May Dreams gardens, it is such a fun way to see what is blooming in other gardens! I’ve met some terrific gardeners through her cyber touring! 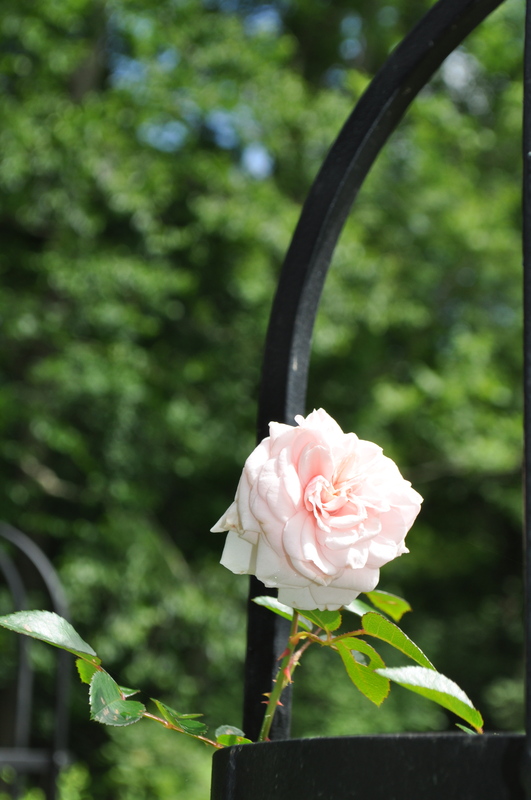 When the heat brings you in from the garden, why not check out your favorite bloggers to see what is blooming! 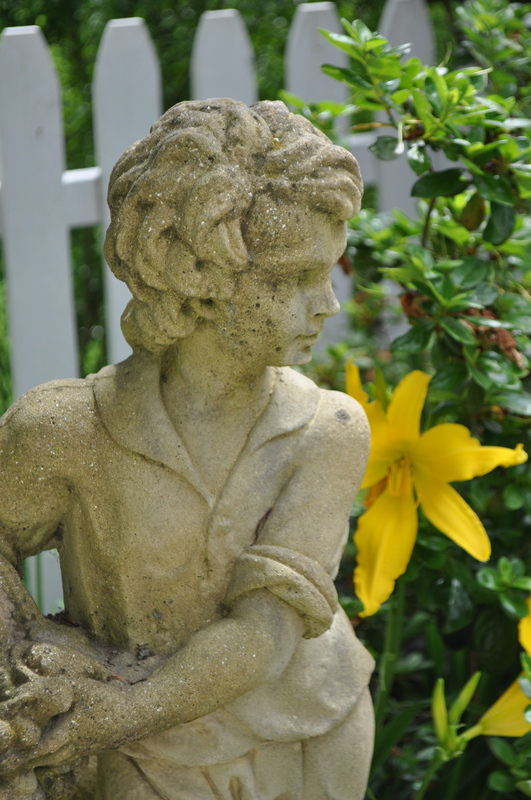 This entry was posted in Uncategorized and tagged agapanthus, cavalier King Charles Spaniels, day lilies, garden fencing, gardens blooming, Hyperion day lily, July garden, lilies, milkweed, rose 'Awakening', sweet peas, sweet peas 'Royal Blend', White Flower Farm. Bookmark the permalink. 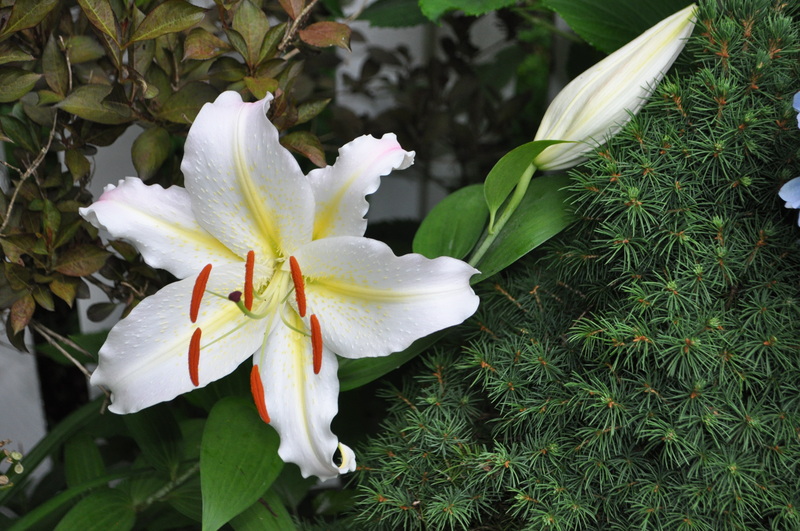 11 Responses to Love the Lilies! What a lovely photo your last one is ! 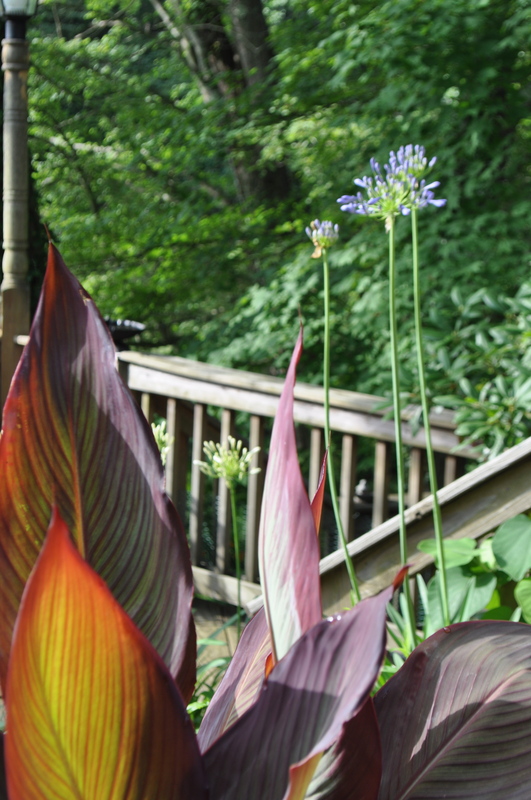 Your Agapanthus are well ahead of ours, but our daylilies are just starting to open. Dead heading is a bore, but its worth doing to make the plants look their best don’t you think? 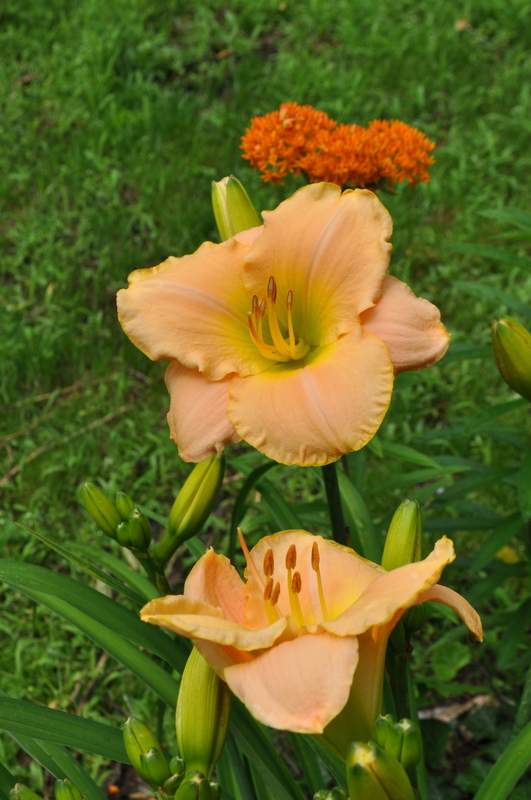 You have some lovely daylilies and wowser on the Queen of the Prairie. It looks so perfect next to the pond. What a lovely blog set up too. Are you in Rhode Island? 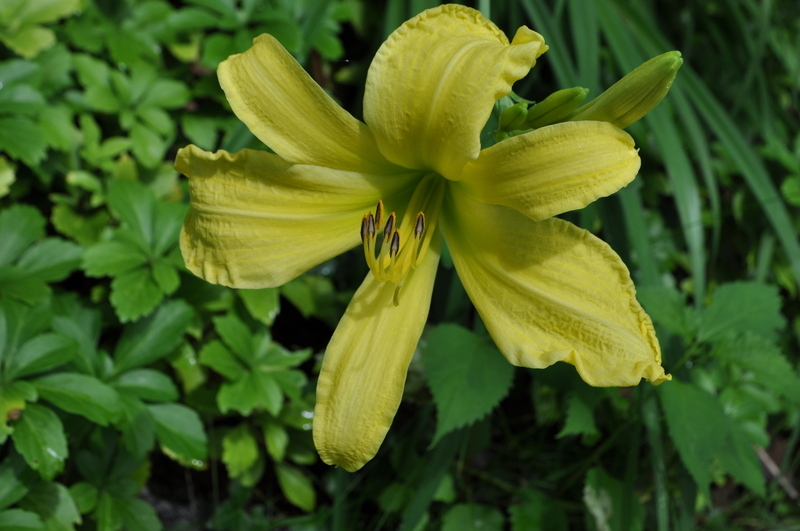 Your bicolor daylily looks a little like one of mine I got from my mother in Maine. I think mine is Gay Troubadour. We don’t see many of them down here in Tennessee. Hyperion is one of my favorites too! Those old fashioned ones are so reliable. Forgot to say I was going to add your blog link to my blog list page so I wanted to be sure I had the right state. Thanks. Your dogs are cute in the picture, they look like they are in puppy jail. Lots of nice flowers in your garden, when all your agapanthus bloom they should be quite glorious. 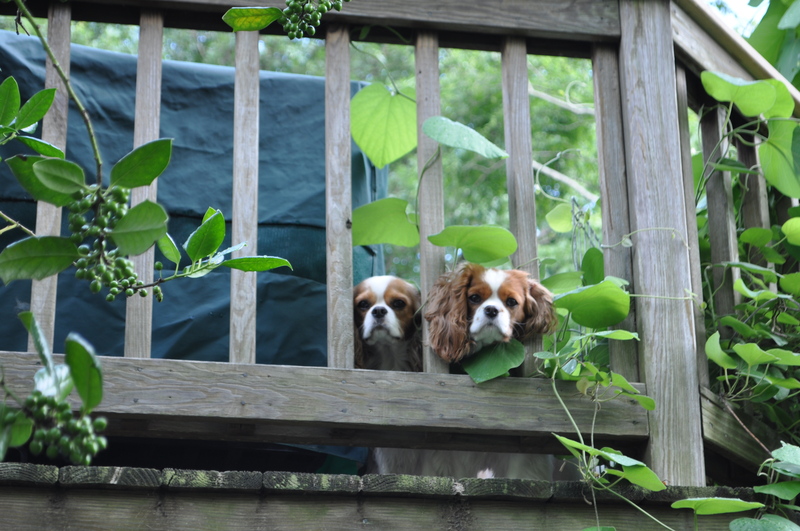 Cute photo of your dogs looking out! 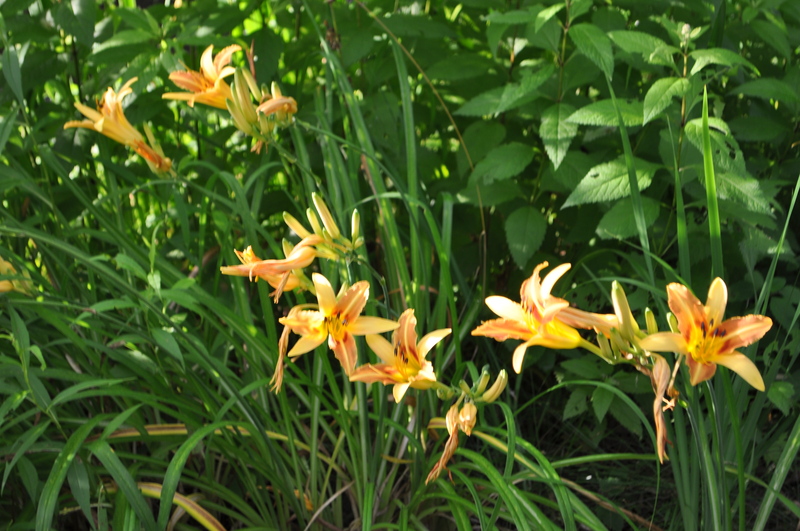 I, too, love lilies of all kind, and you have some very nice ones. 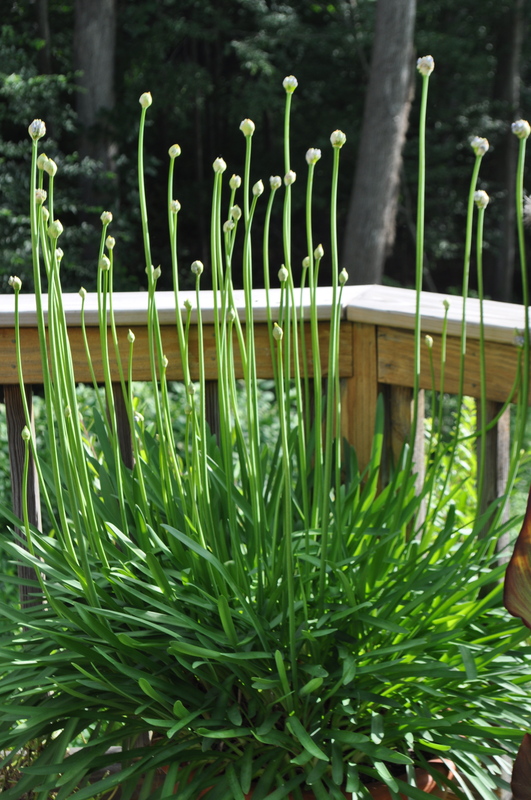 The photo of the agapanthus is so sculptural. And such promise! 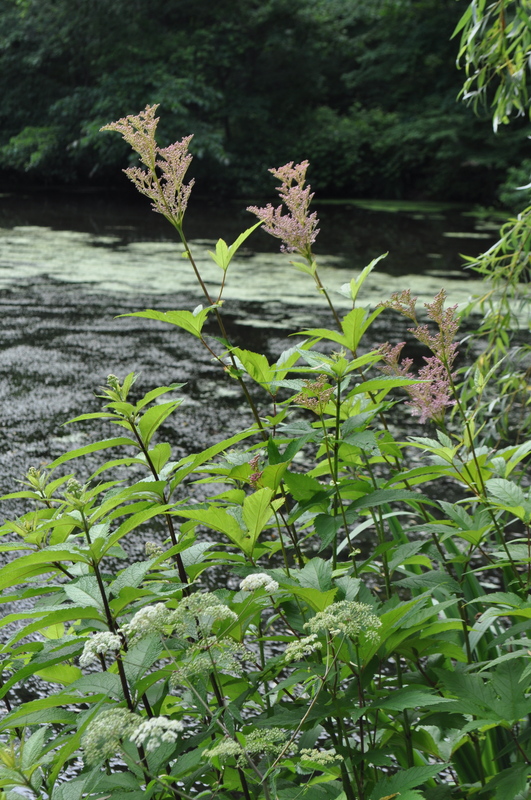 It will be fabulous when in full bloom. 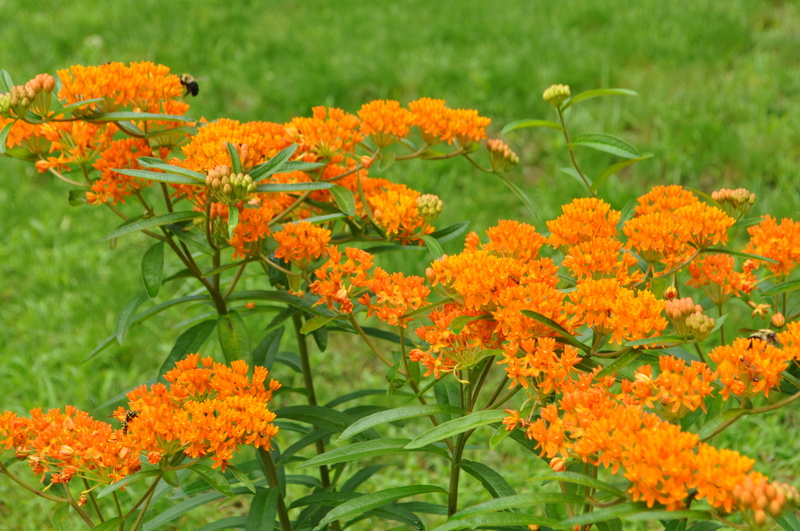 I haven’t seen as many bees or butterflies this year, either. It is a bit worrisome. Dear JAYNE! Good morning! I see you came to visit me, and I thank you kindly for leaving a sweet message! Your garden my dear is so lovely! 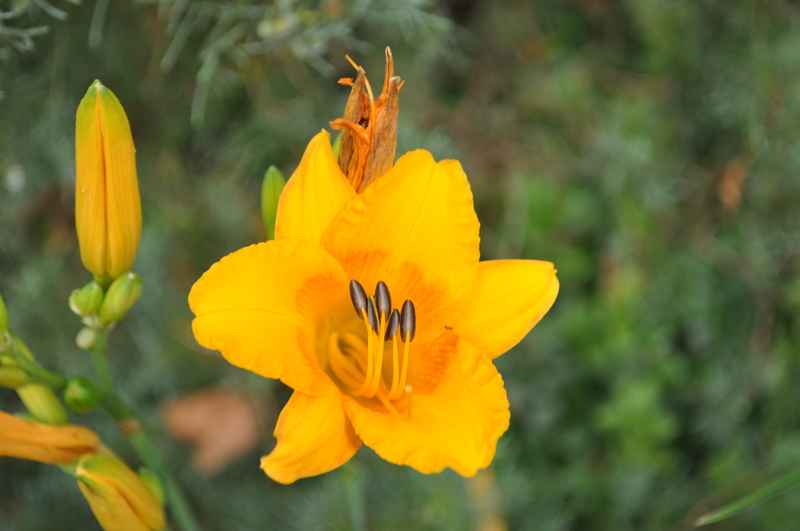 My neighbor across the street has beautiful day lilies in orange while we here have a lush garden of evergreens. The variety of textures and colors in your garden is a July event as I can see and it must bring you great joy to watch. We are having a very humid week but this is summer and we’ll take all we can get! Anita, I too love Summer, but this heat is overwhelming. Shade and iced tea…and a/c. I just finished a book “Rose” by Rosina Harison, about a maid who was in service to Lady Astor. On the cover she is pictured with a silver tea set similar to yours. I also have a lovely English silver tea service that we purchased when we were young and visiting England – and had a little money to spend….glad we got it when that was the case! Mine is similar in for to yours but does not have the elegant ribbing. have a happy Summer day! what on earth are you feeding those agapanthus!!!!! 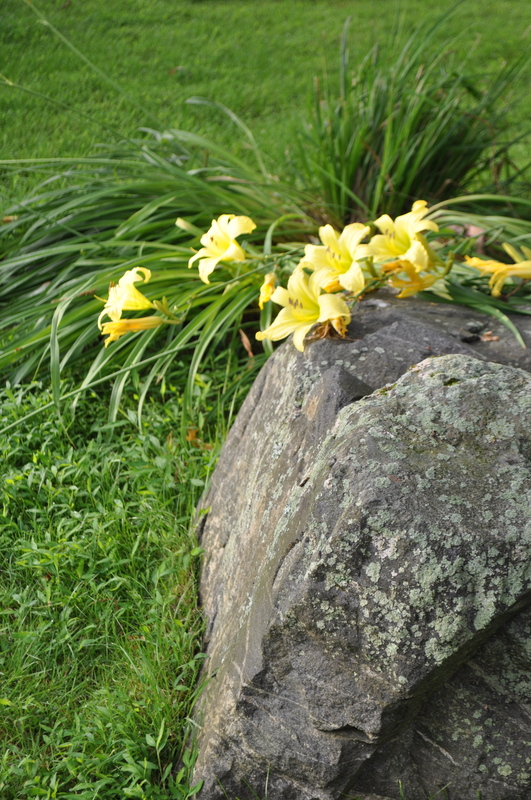 the ones that you gifted me are so sparse, perhaps they miss their Connecticut home. Your gardens are beautiful, as usual, but those baby dogs are the real stars! When are you coming to can???? You have Dutchman’s Pipe!! I don’t find many bloggers that have that. 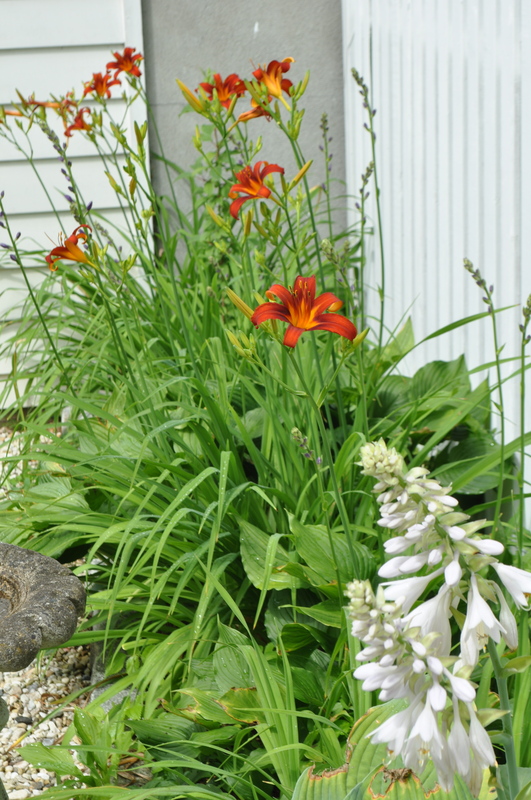 You’ll have to check out the green walls I made with Dutchman’s Pipe, and my daylilies. I must say, though I love my living walls, it spend a lot of time keeping the pipevine in check. It does like to roam. Hi Jayne, I really like the stand of agapanthus you’ve got, they look so big and lush – and numerous! They’re just on the verge of opening and you can almost see the anticipation.